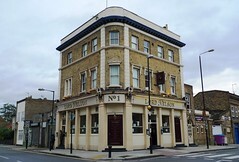 Nice enough pub at the south end of the Isle of Dogs. Note: According to the April/May 2019 London Drinker, the Lord Nelson is closed and up for lease. It's not clear when it will reopen. Inside, the decor is quite smart but not overly posh; it definitely feels like a pub rather than a restaurant. There are a couple of leather sofas, a pool table, and a beer garden out the back. A sign on the wall warns that no children are allowed in the pub after 7pm. Free wireless internet is available (no password; just connect to the Lord Nelson network). There are some board games behind the bar as well, including Scrabble and Trivial Pursuit. There is a quiz advertised on Monday evenings from 8pm (£1 entry). The only real ale in August 2007 was Bombardier, but in April 2008 they had both Bombardier (£3/pint) and Young's Bitter (which was off, though they were in the process of getting it working again). The menu as of August 2007 had starters/light bites between £4 (soup of the day; garlic bread; tempura vegetables) and £5 (prawn cocktail; whitebait; tempura king prawns; mussels). Chips were £2 or £2.75, with the option of cheese or curry sauce for an extra 50p. Baguettes come in white or brown, and cost between £4 (sausage and onion, tuna and cucumber, or cheese and onion) and £7 (steak and onion). Mains are between £7 (beefburger; omelette with your choice of filling; all-day breakfast) and £12 (rib-eye steak). Vegetarian options marked on the menu are vegetarian shepherd's pie and Thai vegetable curry, both £8. (Not sure why the omelette and the vegetable tagine aren't marked as vegetarian.) Desserts all cost £3.45, and include chocolate pudding, apple crumble, and orange and grapefruit sorbet. Cheese and biscuits is £8. As well as the normal menu, roast lunch is available on Sundays; there's a choice of beef or lamb, it comes with all the trimmings, and it costs £9. They also do daily specials. Kake, Noodles and Kami visited on a Sunday lunchtime in August 2007; there weren't many customers but it didn't feel empty. The three of us ordered lunch; unfortunately it turned out that there was a problem with the printer meaning that the kitchen didn't receive the third order. Eventually we asked what was going on, there was a small kerfuffle, and the third meal finally turned up shortly after the other two of us had finished eating. Kake's vegetable tagine (£7) photo turned out to be a tomato-based stew involving root vegetables, spinach, and chickpeas. It was far too sweet, but it wasn't inedible — I just wouldn't order it again. Noodles said his Sunday lunch wasn't bad. Kami liked his steak and kidney pudding (£9 — may only be available on Sundays) apart from the rather tough suet pastry; he gave it extra points for the nice rich gravy inside and the additional jug of gravy that accompanied it. The broad beans that came with it were rather overcooked. Overall: certainly a decent pub, and decent food prices too. Worth a special journey? Possibly not. But definitely worth checking out if you're in the area. Ewan agrees that this is a very nice pub, friendly and relaxed. On a sunny Saturday afternoon it wasn't too busy, and it was pleasant sitting out in the beer garden. Last visited by Ewan, Jo and other Tube Walkers, April 2008. Opening hours taken from the Lord Nelson website, August 2007. Food prices taken from menu in pub, August 2007. Food times taken from sign outside, October 2008. Last edited 2019-03-31 12:32:50 (version 17; diff). List all versions. Page last edited 2019-03-31 12:32:50 (version 17).